This Hornet Card provides the basic outline of the "TIM" Matrix for identifying different learning environments with educational technology. This is really a powerful rubric for evaluating a range of factors in k-12 technology integration. Exploring The "Technology Integration Matrix"
This past week I was able to do my first classroom observation using theTechnology Integration Matrix (TIM). I have wanted to use this tools for a while to be better able to evaluate the classroom environment of technology integration. This matrix always attracted me due to its ability to cut to the chase on how the student, teacher and environment are impacted by different instructional strategies with technology. 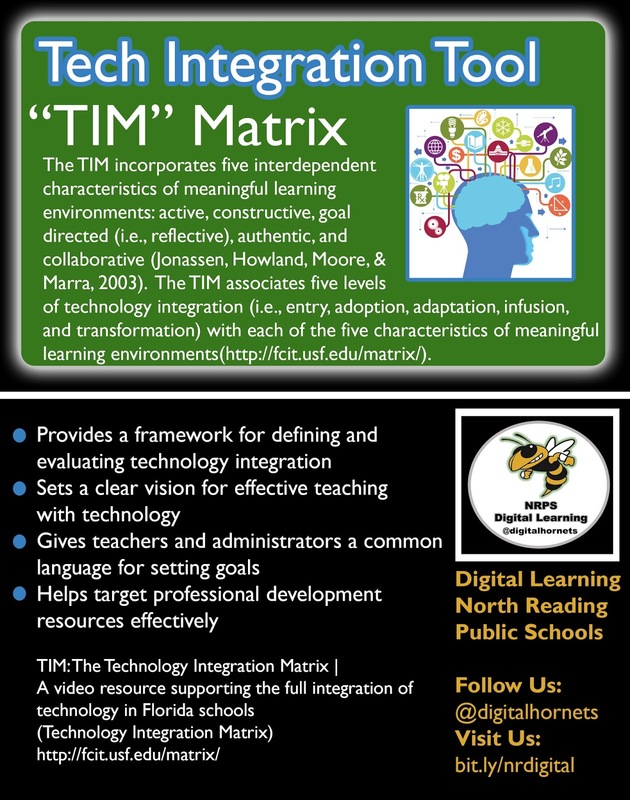 I think that the TIM Matrix help me cut to the chase when reviewing the use of technology in the classroom. The areas that I chose to focus on with this matrix was the teacher’s integration of tools and the classroom environment for the student. I have included a link of the basic matrix of TIM . The matrix expands into each area for both the student, teacher and environment. I found it challenging to view all the parts in one evaluation but used the student’s use of technology and the classroom environment while using technology to help paint a clear picture of the teacher’s integration. There was no need to focus too closely on any one piece as one indicator lead to another. Students collaborated because the project encouraged them to and the teacher’s role shifted to accommodate these shifts. My methodology was to focus on the level of technology integration into the classroom and the characteristics of the learning environment. Before doing this evaluation I had reviewed this matrix several times and decided it could help define best practices for technology integration and assist at making evaluations of environments more specific and targeted towards how the technology is being used and the types of learning environments created by different tools. Is there a collaboration between teachers that makes these learning experiences deeper? What are the questions the students have about the project or use of the technology? What are the specific authentic skills learned by the student? What content is engaging the student? How is this project being organized? My largest gain from using this matrix was that it was easy to extract the best practices from the lesson. The most essential information will help promote growth among my digital learning specialists. We need to be able to evaluate how each environment is different and how we can develop our skills to adapt to different environments. Having a sense of resiliency during the most exciting and challenging parts of instructional technology integration will makes us a stronger team and to grow beyond our environment. Instructional Technologists must hold a higher ground and goal for their instruction. They are not only supporting a teachers goals but they are integrating technology in new ways and modifying lessons to have specific program impacts. manageable to-do lists. This is a great tool because it lets you drag and drop your emails into separate lists. Check out the Sortd.com site and also follow us @digitalhornets ! The current version of Sortd is in private beta so you may need to message them on Twitter for an access code. One of the first things I realized when I came to the North Reading Public Schools this fall was that within each school were tremendously skilled educators and skilled Digital Learning Specialists who were prepared to assist staff and students with better integrating technology. The Digital Learning team has integrated a variety of technology driven curricula into classrooms across the schools and these projects look to improve students’ fluency with technology and expand their creativity. Let me share with you some of the great projects and benefits these lessons bring to students. At the Hood School, Digital Learning Specialist Helen Kelly has embraced digital literacy with her co-teaching and use of the web-based tool Pic Collage. With this tool students can combine text and images on the iPad to express their understanding of learned content and improve students’ fluency using digital tools. Helen has created a more collaborative environment for students using technology as well. One of her projects for the month of October included a lesson in which students determined the difference between “Fact and Opinion” while effectively integrating the interactive SMARTBoard for sharing student response. Students at J.T. Hood Elementary have been exposed new types of learning experiences by better understanding how the digital tools work and how these tools can help them be creative and express their understanding of content. At the Batchelder School future programmers are hard at work. The K-5 students of the L.D. Batchelder School are using Bee-Bots and the Scratch Junior iPad app to learn basic programming skills. Students are also using the scratch software created by MIT to help develop these programming skills. Digital Learning Specialist Chris Lindsay has assisted teachers at integrating robotics within her co-teaching opportunities. The opportunity for Digital Learning Specialist to co-teach enables them to embed technology skills within teachers existing lessons. Students gain tremendous experiences as we ask them to problem solve using technology and real world authentic problems. Not only are we asking them to think outside of the box but we are also asking them to do in a way that will be relevant to their future. At the Little School Digital Learning Specialist Sam Anthony has integrated the use of WebQuests within her co-teaching and Digital Research & Literacy work with classroom teachers. WebQuests are is an inquiry-oriented lesson in which students answer questions and learn from accessing web based information related to their topic. Sam has created these webquests with the use of Google Sites and has enabled access to rich resources for students to validate and use for their projects. Sam Anthony has embedded research skills and digital literacy within her classes by asking them to select resources which support their learning goals. By teaching digital literacy and digital research we are enabling students to be advocates for their own learning. Teaching students proper digital literacy skills enables us to shape the way they interpret and validate the information they find on the web. As digital educators it is our responsibility to prepare students to be fluent with digital research and to think critically and responsibly about the use of the web. At the Middle School in North Reading students are beginning the I-Ready testing on the Chromebooks. I-Ready is an educational software which provides a valid and reliable growth measure for students K-12. Digital Learning Specialist Joanne Coughlin has assisted at effectively administering the test and guiding students through the online testing process. Digital Learning Specialists support not only the integration of technology in the classroom but also many of the technology driven assessments and initiatives that are happening statewide. Part of fully preparing students for the future is also preparing them for the types of learning environments that they will utilize when they leave North Reading Public Schools. In the North Reading Middle School Technology Education course Susan Mussachio has students delving deep into web design using a rich research process and HTML programming. Students are researching topics and creating timelines, concept maps and then self-assessing themselves with the use of Google forms. Students are also learning how to code their HTML web pages based on their topics. Susan brings all the planning, content development and programming together into one product. This curriculum is a great experience for these students as they disseminate the world around them with electronic communication and learn the tools that will assist them in expressing in programming languages and design. challenging projects. The students who take his class are embedded in understanding the design process in engineering and connecting it to their experiences in the real world. A highlight for our department was K-12 Digital Learning Specialist Kathy Dasho presenting at MassCUE 2015. Kathy presented digital storytelling at the Massachusetts Computer Educators Conference on October 22nd. Her presentation was well-attended and many stayed after to ask her questions about the use of Alice programming and Google Earth for digital storytelling. The entire audience was impressed with her technical knowledge and are sharing of best practices. This conference was an opportunity for one of talented educators to share her skills with a larger community of teachers and administrators. In the North Reading Middle School Library Media Center, Lauren Walton has provided all Middle School students an orientation where they learned about all of the resources available to them in the library. Having a certified Library Media Specialist in the North Reading Middle School enables students to have access to over thirty Gale databases for research. In the North Reading High School Library Media Center, Kim Smith has been working with reading classes to instruct them on how to locate print and electronic resources, books and the library catalog. Students have also learned how to locate electronic books and e-books from the Commonwealth e-book collection. Additionally, students learned how to navigate the media center website and find sources for research and how to locate and borrow books, audiobooks, movies and music from Hoopla using an electronic Boston Public Library card. Preparing students to become engage with the world through digital resources and learn how to validate their research and cite appropriately are skills which will carry throughout their academic careers. These resources show a clear commitment in the North Reading Public Schools to assisting students to become better researchers and scholars with digital tools. It has been an eventful month as I still continue to learn about the district and the variety of talented educators that make North Reading a great place to work. In the coming month we will be organizing our district wide “Hour Of Code” event in which all students will have an opportunity to engage with programming skills for at least one hour and defining new ways to work with classroom teachers to embed digital learning across the district. I look forward to expanding Digital Learning curriculum initiatives and defining a Digital Learning pathway for students K-12 in the coming months. There are many new exciting possibilities for all students in the areas of Computer Science and more Project Based Learning with technology. I am proud to be a part of the magic that happens every day in the North reading Public Schools and look forward to a great year! The month of October has flown by in the digital learning team has done a tremendous amount of work with teachers across the schools. At the Hood School Digital Learning Specialist Helen Kelly has embraced digital literacy with her co-teaching and use of the web-based tool pic collage. She has also created more collaborative environment for students using the iPads. Some of her projects for the month of October include lessons which include the students learning the difference between “Fact and Opinion” and reading the story “Leaf Jumpers”. Helen Kelly has also effectively integrated of the use of the interactive SmartBoard into these lessons. At the Batchelder School there a future programmers at work. The K-5 students of the L.D. Batchelder School are using Bee-Bots and the Scratch Junior iPad app to learn basic programming skills. Students are also using the scratch software created by MIT to help develop these programming skills. Digital Learning Specialist Chris Lindsay has assisted teachers at integrating robotics within her co-teaching. At the Little School Sam Anthony has integrated the use of WebQuests within her co-teaching with classroom teachers. With the use of Google Sites to enable students easy access, she has been able to embed research skills and digital literacy within her classes. These tools enable students to walk through an introduction and process section for students and allow students to investigate a variety of different topics such as Space and Science related topics. In the middle schools in North Reading students are beginning the I-Ready testing on the Chromebooks. I-Ready is an educational software which provides a valid and reliable growth measure for students K-12. Digital Learning Specialist Joanne Coughlin as assistant teachers and students at effectively administering the test and guiding students and staff through the online testing process. In the North Reading Middle School technology education course Susan Wasaukee oh has students delving into web design using a rich methodology of research process and also learning HTML programming. Students are developing topics researching these topics and creating timelines and concept maps and then assessing themselves with the use of Google forms. Students are learning how to hand code there HTML webpage is based on their topics. Also in the Middle School robotics teacher Chip Osgood has students learning how to create interactive animation scratch programming. His students are designing their own video game which features an original character is fully user controlled within the environment. They are also creating a variable of responses to onscreen interactions and ultimately control the end of the game. A highlight for our department was K-12 digital learning specialist Kathy Dasho presenting at MassCUE 2015. Kathy presented digital storytelling at the Massachusetts Computer Educators Conference on October 22. Her presentation was well attended and many stayed after to ask her questions about the use of Alice programming and Google earth for digital storytelling. The entire group were impressed with her technical knowledge and are sharing of best practices. 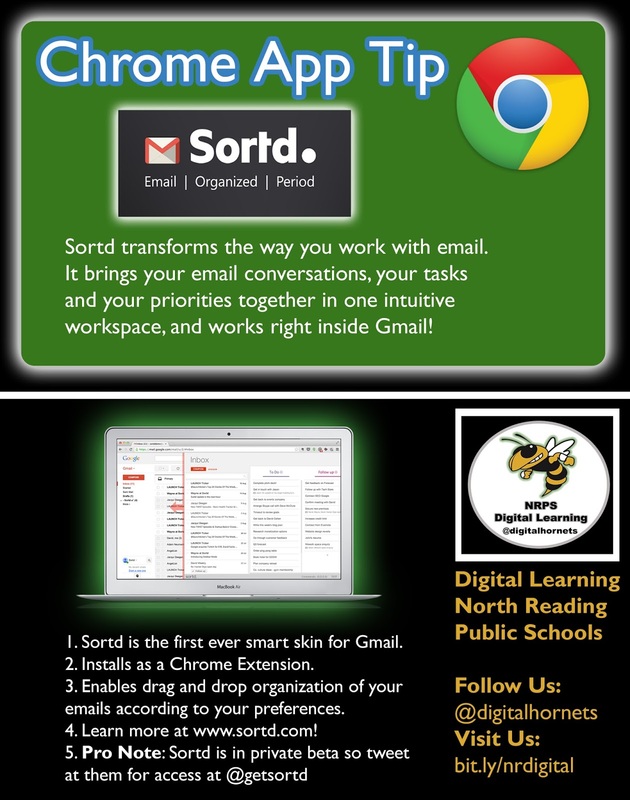 In an effort to streamline the use of Google Apps For Education members the digital learning team attended a training on the Google Admin Console training held at the SEEM Educational Collaborative in Woburn Ma. This training help to ensure the proper management of Google accounts and Chrome devices within the district. In the North Reading Middle School Library Media Center all middle school students have had an orientation to the library media center where they learned about all of the resources available to them in the library on the library website. Due to having a certified library media specialist in the middle school North Reading middle school students now have access to over 30 Gale databases for research. In the North Reading High School Library Media Center, Kim Smith has been working with reading classes to instruct them on how to locate print and electronic resources, books and the library catalog. Students have also learned how to locate electronic books and e-books from the Commonwealth e-book collection. They have also learned how to locate and borrow books, audiobooks, movies and music from Hoopla using an electronic Boston Public Library card. Additionally, students learned how to navigate the media center website and find sources for research. Administrator Nick Langford manages the schools wired and wireless networks as well as providing robust customer service for the variety of hardware and software support needs throughout the district. be organizing our district wide “Hour Of Code” event and looking forward to defining new ways to work with teachers in Digital Learning across the district.